Vinyl limited to 500 copies worldwide, hand-numbered. 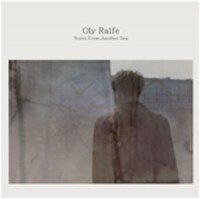 Meditative, melodic and quietly intense, Oly Ralfe’s debut solo album casts a spell, enveloping listeners as it conjures its shifting moods. The piano is key to Oly’s love of music, featuring on many Ralfe Band songs, and the instrumental Notes From Another Sea is Oly’s first album based entirely around the piano. As Ralfe Band, Oly has released three studio albums and composed the soundtrack to Bunny and the Bull (Warp Films / Film 4). Ralfe Band have toured extensively and performed multiple sessions for BBC 6 Music and BBC Radio 2. Oly is also an award-winning filmmaker, and recently illustrated the novel A Field Guide to Reality by Joanna Kavenna (Quercus), his drawings described as ‘beautiful and affecting’ by the Times Literary Supplement.